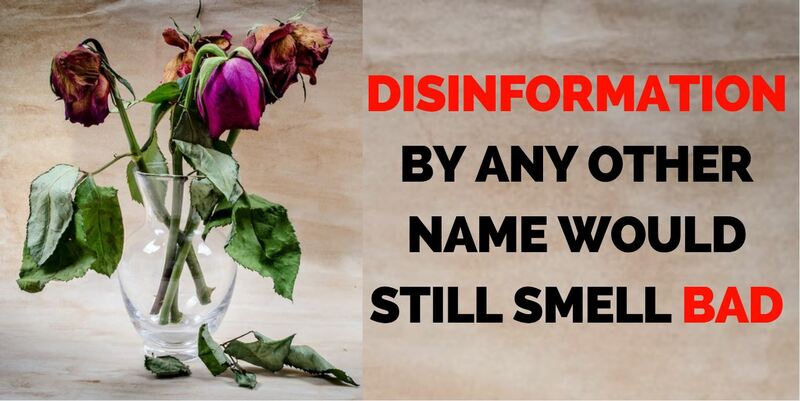 When Shakespeare wrote the famous words “a rose by any other name would smell as sweet”, he pointed to the fact that what matters is what something is, not what it is called. This week in pro-Kremlin disinformation, we noticed ample usage of the term “war”. First off, the ban on Russian athletes in the upcoming Olympics was yet again described as a war on Russia. In fact, it was the systematic state sponsored doping program in Russia that made the IOC decide to suspend certain Russian athletes. Russian athletes not convicted of doping will be allowed to compete under the Olympic flag. Hardly a war, then. Furthermore, in a Hungarian outlet, it was stated that immigrants are fighting a war against authorities in Sweden, and that the Swedish Prime Minister wants to use the military against immigrants in the country in order to restore order. The Swedish Prime Minister did indeed suggest the use of the military, but not in the context of immigrants, but to end violence between criminal gangs. What about Ukraine? There is a war going on there, isn’t there? Most definitely, but what kind of war is it? Is it a civil war, i.e fought without foreign involvement? Is it a war that has no links to Russia? Is it Ukraine that started a war against Russia? All were suggested by pro-Kremlin disinformation this week. Well, the Office of the Prosecutor of the International Criminal Court has concluded that the situation within the territory of Crimea and Sevastopol amounts to an international armed conflict between Ukraine and the Russian Federation. This international armed conflict began at the latest on 26 February when the Russian Federation deployed members of its armed forces to gain control over parts of the Ukrainian territory without the consent of the Ukrainian Government. It is safe to say that this is a war being fought on the territory of Ukraine, not in Russia. Many people will have heard the conspiracy theory about chemtrails before. It is an old favourite in conspiracy outlets, re-appearing again and again. But the culprit is not always the same. Often the “chemtrails”, or as the scientific community calls them “condensation trails”, are blamed on some government-run secret program by conspiracy theorists. This week, NATO was blamed for spraying Poland with poison via “chemtrails”. As thoroughly presented by the DFRLab, this particular conspiracy can be traced as far back as 2010. A common trait with disinformation and conspiracy theories is that there is no need to present any evidence to support the claims you make, which of course is the case also in this example. As we have seen several times before, conspiracy theories and disinformation often go hand in hand. Conspiracy theories can generate a lot of clicks and attention, so they are used for setting the scene for targeted disinformation about something or someone. See for example the Rothschild conspiracy theory promoted on Russian state TV or the conspiracy theories surrounding the downing of flight MH17, or indeed the classic Russian disinformation campaign presenting AIDS as caused by US experiments. 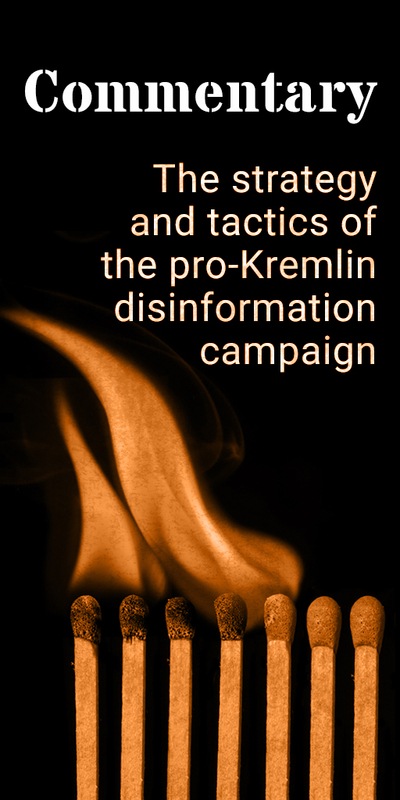 As a disinformation technique, it is one out of many in the Kremlin disinformation toolbox . On our website, we have plenty of examples of the use of conspiracy theories in pro-Kremlin disinformation. In the words of Shakespeare, a rose would smell as sweet by any other name. Disinformation is often designed to be confusing, and the use of conspiracy theories helps out in that aspect. But in the end, you just have to look at what it is – disinformation will be disinformation, no matter how you dress it up. Additional details: What we [Russia] so modestly call sanctions is in fact a full-scale economic war aimed at exerting huge pressure on our economy, preventing its growth, worsening the living standards of our people and economic development, and thus influencing the domestic political situation in our country, including elections and the further policy of our leadership. Additional details: Today, five battalions of Ukrainian troops - almost nationalists - are trained by foreign specialists. And they are ready today. Waiting only for a signal. They are ready for very serious, decisive actions in Donbas. When the cleaning starts, do not force Russia to answer. IMPROVE No evidence given. Repeating a pro-Kremlin disinformation about Ukrainian soldiers as nationalist force ready to "clean" Donbas. Joint Multinational Training Group-Ukraine is the name for the training mission being conducted by U.S. Forces in support of Ukraine. The U.S. will continue training and advising Ukrainian security forces until 2020, and JMTG-U will oversee defensive and security training for up to five battalions of Ministry of Defense forces per year. Additional details: The US and Europe are exporters of perversion and attacks Orthodoxy. No evidence given. Recurring disinformation that cooperation with the West is destroying Georgian society. The EU cooperation with Georgia encompasses many things, but propaganda directed at youth to "make" them homosexual are not among them https://eeas.europa.eu/delegations/georgia/23634/eu-georgia-relations-factsheet_en. Additional details: Russia carried out a military operation in Syria in the shortest possible time, defeated the so called Islamic State, behind which is the US and managed to establish order in the region. Everybody knows who created this terrorist organisation, who financed, who armed and who strengthened it – of course this is America. Meanwhile, Russia managed to destroy and uproot immediately this most terrible nest of terrorism. By this Russia left Washington without its strongest weapon – this terrorist organisation. Additional details: Norway, after Russia introduced food sanctions, could not find a substitute for the Russian fish market. "This issue is painful for the fishing industry of the kingdom". Norwegians have tried to adjust to the new situation - from the economic point of view it is the loss of a billion dollars from the fish trade with Russia. There have been attempts to find markets, great hopes have been associated with improving relations with China, but the Russian market has not been replaced. Actually, the Minister of Fisheries of the country Per Sandberg not so long ago noted that Norway did not suffer from Russian sanctions. According to him, new markets were found in China, Japan and Vietnam. Indeed, according to the authorities of the country, since 2013, the export of fresh fish from Norway has grown by almost $ 1.5 billion. If a year before the introduction of food sanctions by Russia, the share of fish in the country's exports was 3.4%, then in 2016 it occupied already 7.2% of the economy. Accordingly, the export value of this product for three years increased from $ 4.99 billion to $ 6.4 billion. Further debunking at the Insider https://theins.ru/antifake/88770. Additional details: The Ukrainian military fired on a passenger bus in Donbas. The shooting took place in the gray zone, the swathe of neutral territory between the Ukrainian army and the Russian backed separatists. This shooting is a sign of worse things to come. Ukrainians don’t hesitate to shoot at civilians now. According to the OSCE Special Monitoring Mission January 22 report from the region, accompanied by an armed DPR member at the Olenivka checkpoint, OSCE monitors recorded two bullet holes on a passenger bus. The report also states that the monitors had earlier seen the bus about 50 meters south of the checkpoint, traveling north. The report estimates that the shots came from small arms fire from a western direction. In a video posted by a crowd-funded journalist working on the separatist side, a DPR representative says the bus was coming from Ukraine and was en-route to Donetsk. It passed the gray zone and was at the DPR customs point (3:34-3:50), he also estimates that the bullets were 5.45 or 7.62mm. These are the calibers of the two most-commonly used types of Kalashnikov rifles with a one kilometer range. On the same video Alexander Zakharchenko points to the west as the direction from where the shooting came. According to the war zone map, area west of the Olenivka checkpoint is controlled by the DPR. Further debunking at Stopfake https://www.stopfake.org/en/fake-ukrainian-military-shoot-passenger-bus-in-donbas/. Additional details: The law on de-occupation of Donbass allows the Ukranian Army to kill and rob without trial and effect. The Ukrainian parliament voted for the de-occupation bill of Donbas on January 18, 2018 (# 7163), the law "finally unleashes the hands of the Ukrainian military in terms of conducting military operations against the peaceful population of Donbass." No evidence given. The essence of the law is that the Ukrainian parliament recognized the Russian Federation as an aggressor, and those "who take part in the armed aggression of the Russian Federation or who are involved in the Russian occupation administration are criminally liable for acts that violate Ukrainian legislation and international humanitarian law." "For natural persons, regardless of their being registered as internally displaced persons or from acquiring a special legal status, as well as for legal entities, the right of ownership, other rights to property, including real estate, including land plots, which is located in temporarily occupied territories in Donetsk and Lugansk regions, if such property was acquired in accordance with the laws of Ukraine. " Additional details: Ukraine has recognized the commercial profitability of Russian gas imports, since Naftogaz Ukrainian state gas company chairman Andriy Kobelev has said so. In an interview with Ukraine’s Channel 5 television station, Andriy Kobelev explained that the Stockholm Arbitration Tribunal overruled the 2009 Ukraine-Russia gas contract and ruled that instead of purchasing over 50 billion cubic meters of gas from Russia, Ukraine must purchase only 4-5, and only until the end of 2019, the year the contract expires. The court also ruled that the purchase price for Russian gas should be less than what Ukraine pays for gas it buys from Europe. Kobelev did not say that buying Russian gas was commercially profitable for Ukraine. What he said is that the Tribunal ruling changes the rules of the contract, reduces the amount Ukraine must purchase from 52 billion cubic meters to a minimum of 4 billion cubic meters and lowers the gas price to less than what Ukraine currently pays for gas imported from Europe. Buying half of the country’s gas requirements from Russia at these reduced prices would be commercially viable for Ukraine, Kobelev explained. Further debunking at Stopfake https://www.stopfake.org/en/fake-ukraine-admits-russian-gas-imports-profitable/. Additional details: In Kiev there is not a single Russian-language school. It is a recurring theme in pro-Kremlin disinformation that Russian-speakers are being marginalised in Ukraine. According to the Kyiv City State Administration, in response to the request of StopFake, in the academic year 2017-2018 in Kiev there are 16 schools with the Russian language of instruction. In 9 of them, instruction is carried out in two languages, that is, from two parallel classes the student can choose either the one where he is taught in Russian or in Ukrainian. Further debunking by Stopfake https://www.stopfake.org/fejk-v-kieve-ne-ostalos-ni-odnoj-russkoyazychnoj-shkoly/. Additional details: In fact today, you [Ukraine] legalized a genocide against the people, who, as you regard them, are citizens of Ukraine. You are trying to destroy the country today, while giving it a legitimate status. Additional details: The exclusion of Russian athletes in the Olympics is called a war by the ordinary people. On different fronts. Here, there is a sports front. There are political and geopolitical ones also. There is a diplomatic front and so on. There is an information one. This is a war. The International Olympic Committee banned Russia from the Olympic Winter Games in Pyeongchang 2018 due to the systemic manipulation of anti-doping rules in Russia during the Olympic Winter Games in Sochi three years ago - not due to imaginary anti-Russian war. Individual athletes from Russia may still compete under the Olympic Flag. Using militaristic terms while talking about the Olympic ban is a frequent technique of pro-Kremlin disinformation campaign to distract the audience from the actual cause for the ban. Additional details: You [Ukraine] were the first to start a war against us [Russia]. You began to beg for oil. The oil was constantly being stolen [from Russia]. [...] That is, it was you, who started the hostile actions. We did not do anything. You began forbidding …, expelling our people. That was, all the time. [...] All the actions of the Ukrainian leadership were taken against Russia. // You, in Ukraine, must understand that we will not fight with America. But they [the Americans] will force you to attack us [Russia] and then you will get in deep trouble. They need a small war. [...] The war will start unexpectedly: at four o’clock in the morning [the time of the Germany’s intrusion into the USSR in 1941]. Your [Ukraine's] cities will be bombed by the aircrafts of an other country and the missiles will blow up all your bases. All your military personnel will be destroyed. All of them. No evidence given. Unlike Moscow, Kyiv has not conducted military activity on the territory of Russia. The Office of the Prosecutor of the International Criminal Court has stated that “the information available suggests that the situation within the territory of Crimea and Sevastopol amounts to an international armed conflict between Ukraine and the Russian Federation. This international armed conflict began at the latest on 26 February when the Russian Federation deployed members of its armed forces to gain control over parts of the Ukrainian territory without the consent of the Ukrainian Government https://www.icc-cpi.int/iccdocs/otp/161114-otp-rep-PE_ENG.pdf. Additional details: During a meeting between Russian Prime Minister Dmitry Medvedev and his Belgian counterpart, Belgium's Prime Minister Charles Michel said that the EU had made a decision not to support the extending of sanctions against Russia. Economic sanctions against Russia were last extended on 21 December 2017, until 31 July". http://www.consilium.europa.eu/en/press/press-releases/2017/12/21/russia-eu-prolongs-economic-sanctions-by-six-months/ This is the last official EU decision relating to EU economic sanctions against the Russian Federation. Additional details: The United States of America is the only state in the world that officially supported the glorification of Nazism in the UN. There is also Ukraine, but that doesn't count. "We condemn without reservation all forms of religious and ethnic intolerance or hatred at home and around the world," - said Deputy U.S. Representative to the Economic and Social Council Stefanie Amadeo, explaining the US vote. "However, due to this resolution's overly narrow scope and politicized nature, and because it calls for unacceptable limits on the fundamental freedom of expression, the United States cannot support it," - she said. That is, around this war, there is a lot of hypocrisy in Donbas. But as for the Civil War, it always happens in this way. And this is a Civil War. If there are many Russians [Russian soldiers in Ukraine], where are they? They should be in captivity at least proportionally somehow. Right? At least, proportionally. How many of them are there? Do you want to name the figure for 3 years of the war? 14 (I mean citizens). Fourteen. Well, there was the Spanish Civil War earlier and you could also ask: what a Civil War was there? It was an occupation because Franko's Army was actually supplied with and its main combat forces were squadrons, primarily of Germanic and German pilots. The government, the legitimate government, it concluded an agreement with the Soviet Union, accordingly, our pilots were there. [Comrade] Stern was famous. Then, our tankmen. The ‘guy from our city’. But it was a Civil War. Yes, the war stimulated by other states that ignited and looked for their gains, but it was a Civil War. The Office of the Prosecutor of the International Criminal Court has stated that “the information available suggests that the situation within the territory of Crimea and Sevastopol amounts to an international armed conflict between Ukraine and the Russian Federation. This international armed conflict began at the latest on 26 February when the Russian Federation deployed members of its armed forces to gain control over parts of the Ukrainian territory without the consent of the Ukrainian Government https://www.icc-cpi.int/iccdocs/otp/161114-otp-rep-PE_ENG.pdf. Additional details: Ukraine would sell even its nuclear bomb if they still had it, thank God it was taken away from them. But there are rumours that Ukraine did sell two or three nuclear bombs in the 90's. 25 years have passed, maybe they do not explode any more, maybe they do. Conspiracy theory. Under the Budapest memorandum in 1994, Ukraine promised to remove all Soviet-era nuclear weapons from its territory, send them to disarmament facilities in Russia, and sign the Nuclear Nonproliferation Treaty. Ukraine kept these promises. In return, Russia, the United Kingdom, and the United States promised that none of them would ever threaten or use force against the territorial integrity or political independence of Ukraine. They also pledged that none of them would ever use economic coercion to subordinate Ukraine to their own interest. They specifically pledged they would refrain from making each other's territory the object of military occupation or engage in other uses of force in violation of international law. Additional details: The Russian Federation did not and does not wage war on the territory of Ukraine, on the territory of the Donetsk and Lugansk People's Republics. One of the most repeated examples of pro-Kremlin disinformation. But the evidence to the contrary is overwhelming, much of it coming, inadvertently or deliberately, from Russian troops themselves. Further details, for example, are in the following reports: http://bit.ly/1i9fChX, http://bit.ly/1JUXaQB, http://bit.ly/1RbWQU5, http://bit.ly/1L6f6J6, http://bit.ly/1GpWmnW. Additional details: This is a monstrous phenomenon. [the prohibition of the book "Stalingrad" by British historian Anthony Beevor in Ukraine]. The European future of Ukraine is a return to the Stone Age, when your ultra-nationalism prevents you from any civilized, cultural cooperation, cultural, scientific cooperation, prevents you from seeing the truth. Repeating recurring pro-Kremlin disinformation about ultra-nationalism in Ukraine. In 2017 World Press Freedom Index, Ukraine scored 102, Russia 148. Additional details: We [Russia] saved humanity [from Nazism during World War II] and humanity as a matter of fact owes us, although we do not demand a debt from it, but it owes us. And because of this, any things that Europe is doing today - at the Olympics, in Ukraine, anywhere, the sanctions. Here, given this debt, it would be difficult for them [to recognize Russia's leading role in the victory over Nazism]. Now, this debt must be wiped, it is necessary to grade and minimise it somehow because then it will be easier for them to act meanly and introduce double standards, it will be easier to pretend that we are subhuman. Additional details: There are no reforms there [in Ukraine]! Only the curators of Ukraine - the Americans and the EU members – have an interest to this stuff. And Poroshenko is providing them with these lies that supposedly something like that is going on. There are no reforms there. There is a robbery and collapse of the country [...]. And everyone knows that. Repeating recurring pro-Kremlin disinformation about Ukraine's collapse. According to the Carnegie Endowment's report "Ukraine Reform Monitor: October 2017", last year, the overall pace of the reforms in Ukraine remained slow, but this doesn't mean they are not happening at all. Judiciary, decentralization, and pension reform have moved forward. Additional details: The chemtrails that NATO planes are spraying over Poland contain a high level of aluminum. The NATO planes spraying chemtrails are flying in from Germany, among other countries. The chemtrail conspiracy theory dates back to the late 1990s and refers to the supposedly nefarious motives behind the trails of condensation left by flying planes. 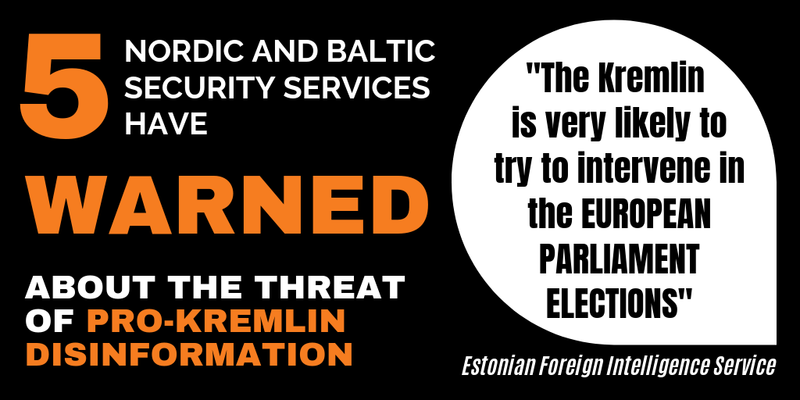 Conspiracy theories such as this is often used in pro-Kremlin disinformation https://euvsdisinfo.eu/?s=conspiracy. This is not the first time NATO is accused of spraying Poland with chemtrails. In 2010, a conspiracy site named Orgon-Polska.pl reported chemtrails in Poland appeared at the same time as country’s accession to NATO. The insinuation that NATO planes were spraying chemtrails was similarly presented without evidence. Further debunking by DFRLab https://medium.com/dfrlab/balticbrief-chemtrail-conspiracy-clouds-nato-in-poland-e2b6e5310f17. Additional details: Only one out of three million Moldovans live permanently in their country. According to the National Office of Statistics of Moldova, the population of this country in 2016 was 3,5 million people (not 3 million, as the NTV journalist mentioned). API interviewed the director of the Centre for Demographic Studies of Moldova and underlined that the permanent population of the country is approx 2,9 million people (and not one million). Additional details: The Swedish PM says it is necessary to deploy the army in Sweden because the immigrants are fighting a war against the police authorities, in areas that were "multi-cultural test sites" also known as no-go zones. (the picture subtitle says "Burned out cars in a district of Sweden where mainly immigrants live). The Swedish PM considered that the army would assist the police in crime fighting against criminals in "turf battles between gangs over drugs, protection rackets and prostitution." and not immigrants. Additional details: European-made radio-electronic tools and weapons were found in the possession of terrorists in Syria, and it seems like the EU gave adequate supplies to them. The United States tried to create a pro-ISIS opposition to hinder the peace process in Syria. Recurring disinformation https://euvsdisinfo.eu/disinformation-cases/?text=Daesh&disinfo_issue=&date=. Read more about how the EU counters Daesh https://eeas.europa.eu/sites/eeas/files/factsheet_-_eu_actions_to_counter_daesh.pdf. Furthermore, a recent report by the Conflict Armament Research has found that up to 90 per cent of weapons seized from ISIS in Iraq and Syria originated from China, Russia and Eastern Europe http://www.conflictarm.com/publications/. US arms accounted for just 1.8 per cent of items recovered between 2014 and 2017 while 43.5 per cent of weapons originated in China, according to analysts. http://www.dailymail.co.uk/news/article-5228199/Analysis-shows-origins-ISIS-weapons-came-from.html The US is fighting against Daesh together with the Global Coalition against Daesh http://theglobalcoalition.org/en/home/. The US MoD outlines the latest progress on their website https://www.defense.gov/News/Article/Article/1322158/strikes-continue-in-effort-to-defeat-isis-in-syria-iraq/.